We’re in a street ‘downtown’ somewhere. Somewhere in America. Somewhere in the Seventies. We know it’s the wrong side of town too. A young rookie Police Cop is cradling his dying older brother, to whom he makes the solemn promise to become “the Best. Damn. Police. Cop. Ever.” The earnest, drawn out, staccato delivery is a perfect parody of every American police movie or television series of that decade, but a mere taster for the next hour during which every nuance, plot twist and cliché are thrown into the back of the car and taken for a ride. And what a roller-coaster ride it is. It’s a ludicrous, hilarious journey. 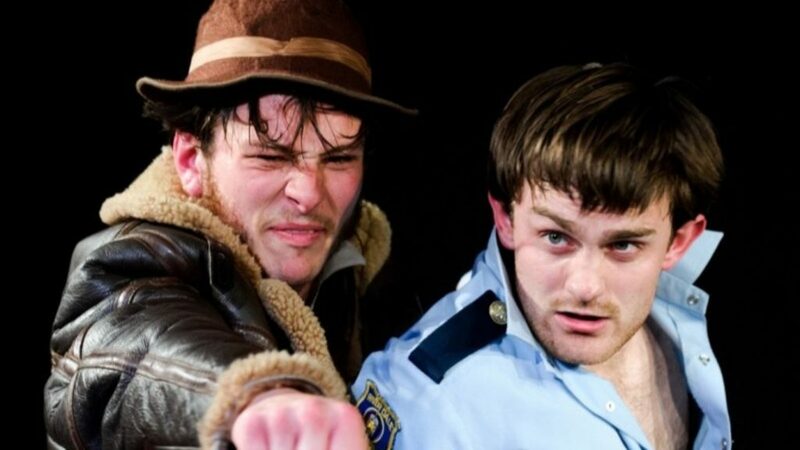 It is a high-speed chase keeping up with Zachary Hunt, Tom Roe and Nathan Parkinson; the award-winning trio that have brought this show to the VAULT Festival following sell out runs at the Edinburgh Festival and the Soho Theatre. Armed with just sheer ingenuity, stamina and a handful of throwaway props and costumes they don’t let a second of stage time pass by without a gag. The only downside to this is that we have very few spaces to breathe between the laughs. Political correctness is thrown out of the window from the start. After his brother’s soul has been carried away by the angels, the young cop Jimmy Johnson (Zachary Hunt) sets off to make good his promise. But not without enlisting the help of grizzled, disgraced, chain-smoking, beer-guzzling, ex-cop Harrison (Tom Roe). They have twenty-four hours to track down and ‘take out’ the Mexican drug baron Hernandez (Nathan Parkinson) in his hideaway before the Chief down at the Precinct starts breathing down their necks. Of course, they don’t play by the book; they lose their badges, split up, go it alone, reunite, have a quick ‘bromance’ and eventually sniff out the rat, Hernandez. In the meantime, there is a Flamenco version of the Rolling Stones’ “Paint It Black”, a villainous cat and a trip to Heaven and back, among many other off-the-wall through-stories, back-stories, subplots and moments of losing the plot. The sense of fun is infectious, and we therefore forgive, even encourage, the corpsing and occasional adlibbing as they try sometimes to trip each other up. They have earned the right to that playfulness by being masters of their craft in the same way highly skilled jazz musicians can wander off on a tangent, yet fall back in time with the rest of the band within a beat. A musical analogy that can be extended to their physicality, too, displayed in some quite remarkably skilful, yet still tongue-in-cheek, choreography. “Police Cops” is a real joyride of a show, and just as the intrepid cops are cleaning up the streets, I sense too that they will also clean up at the awards.